FastCGI is a language-independent, scalable, open extension to Common Gateway Interface (CGI) that improves performance. The FastCGI extension is installable onto Server Core and enables application frameworks such as PHP to achieve improved performance and stability on Internet Information Services 7 (IIS 7) and above. Installing FastCGI when hosting PHP applications is very strongly recommended. In this example, we install FastCGI support to prepare the server to host our PHP application. Depending on the PHP installation location, paths to executables on the hard disk may require updates. Note that the AppCmd.exe example commands above assume that PHP installation is in the D:\PHP directory. Download the latest PHP release. In the section titled "Windows Binaries," select the archive with the .zip file extension. Note that the Server Core lacks a graphical user interface (GUI), and has no Web browser. Uncompress the archive's contents to a location accessible by the Server Core system, which is likely to be a network file share. Copy the entire contents of the PHP archive you uncompressed previously into the %SystemDrive%\PHP directory. Save the file as phpinfo.php to c:\inetpub\wwwroot\. From a connected computer, open a browser window, and go to http://%systemhost%/phpinfo.php. 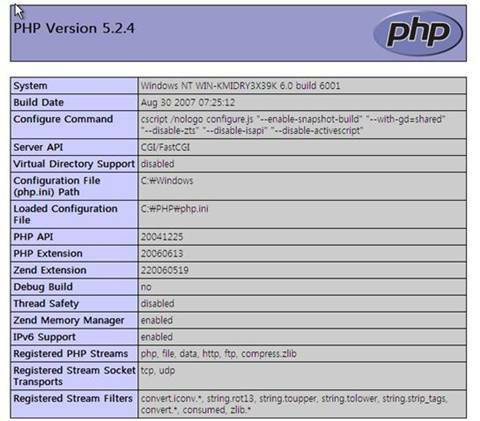 A page appears showing the PHP configuration. This article updates IIS 7.0 and Above on Server Core by Tobin Titus, published on September 11, 2009.